How often do you not f ollow through with an idea because of fear of what people will think of you? How many times do you let the words of someone else affect the way you see yourself? The truth is that how others see you is a perception that has nothing to do with who you are at all. It’s all in the realm of their own reality. I’m not saying that other people’s opinion do not ever matter: we sometimes need feedback from our mentors so we can excel; we want to hear from our loved ones and know that our relationships are harmonious; it is good to get feedback from those we serve to know how we can be more effectively and efficient. Yet, even in these instances, we are seeking their perspectives about what we do and not necessarily who we are. Just as it is true that we do not need to believe the negative things people say about us, it is also true that we also must not become attached to the positive things people say either. WHAT? When you take the opinions of others to heart you may be allowing your ego to stand in the truth of your reality. Don’t allow their negative opinions keep you from trying to move toward your dreams. Don’t let the positive reinforcements you hear allow you to become content and stop your quest of mastery. Stand in your truth and live your self to the fullest potential. 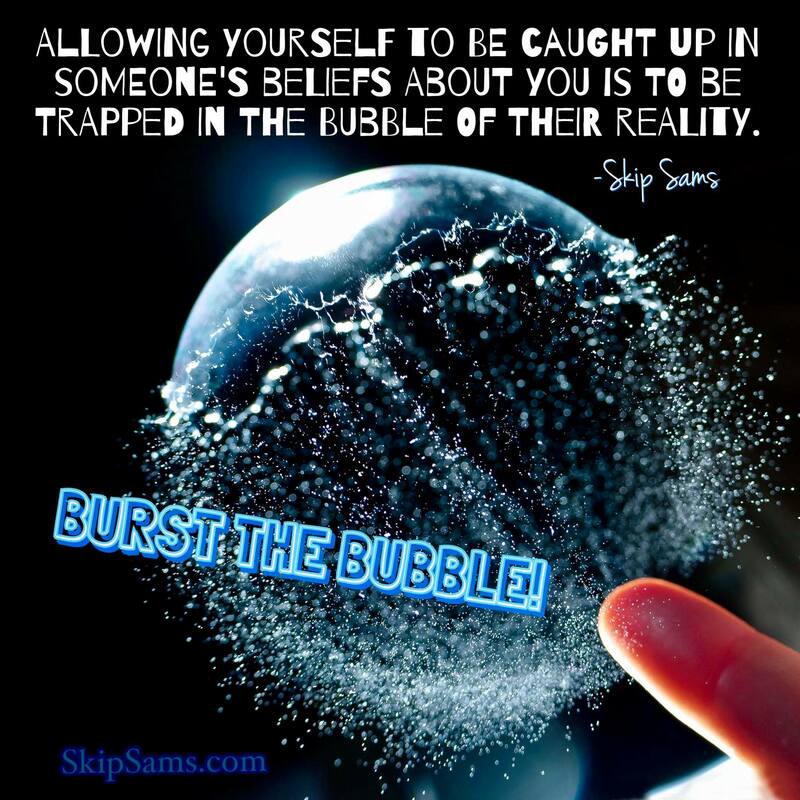 Allowing yourself to be caught up in some’s beliefs about who you are is to be trapped in the bubble of their reality. Go ahead, DARE TO BURST THEIR BUBBLE! Skip Sams is an award-winning composer and a personal success coach who is passionate about helping others live creatively and authentically.